My search for an easy recipe for a perfect loaf of French bread started on my trip to Denver last month. My cousin and I were browsing bread recipes and found them all totally convoluted, intense, and just impractical, so I promised that I’d find out the secret to easy French bread and then share it with her on this blog. Well, I’ve found that secret in another gem from my cooking idol, Laura Calder. I’ve switched up a few things from her original recipe: I added a bit more salt and used half whole wheat flour. A word of caution, though: it might be an easy recipe, but it takes a really long time—you might even say, foreverrrr. Whisk together flours, salt, and yeast. Stir in 1 1/2 cups warm water, and add the 1/4 cup water if needed. The dough should not be dry, and it’s okay if it’s pretty wet–it should be sticky, rather than a firm dough ball. Cover the bowl with a tea towel or plastic wrap and let sit in a warm place for at least 12 hours, or at most 24 hours (I let mine sit 16 hours in the oven–keep the oven off, but leave the oven light on). The dough is ready for the next step when you see little bubbles formed on top, and it will have just about doubled in size. If a brown crust has formed over the top of the dough, just use a spatula to fold it over once or twice to work this crust into the rest of the dough. Take a tea towel and flour it generously. 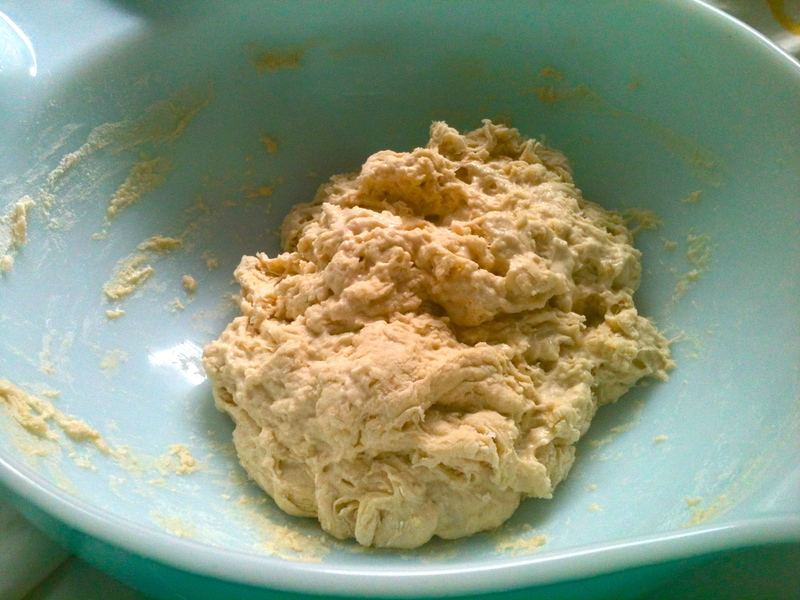 Place the dough onto the floured towel and turn the dough over so that all sides are floured. 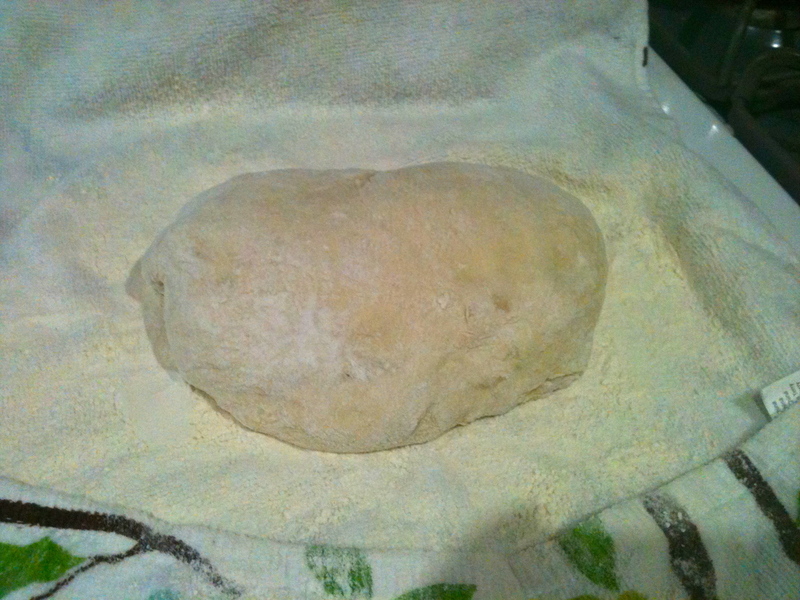 Knead it twice, fold the sides underneath it and shape into a dome. Dust with more flour or cornmeal and wrap dough ball lightly in floured tea towel. Let sit for 2 hours. Just before 2 hours is up, preheat oven to 450 F with Dutch oven or bread pan inside to heat. 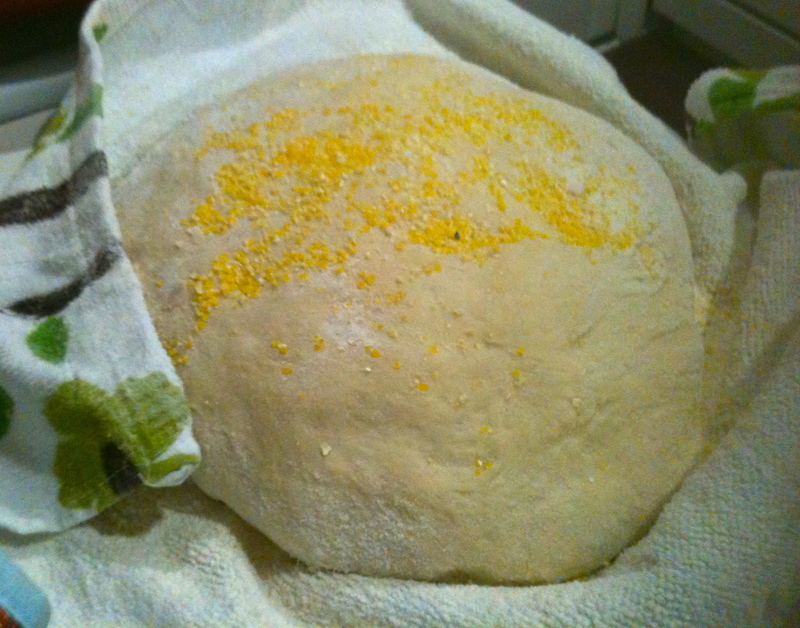 The dough ball will have more than doubled in size. When the oven is preheated, transfer dough, seam side up, into the pan. Shake the sides of the pan to settle dough evenly, and bake for 30 minutes with the lid on. 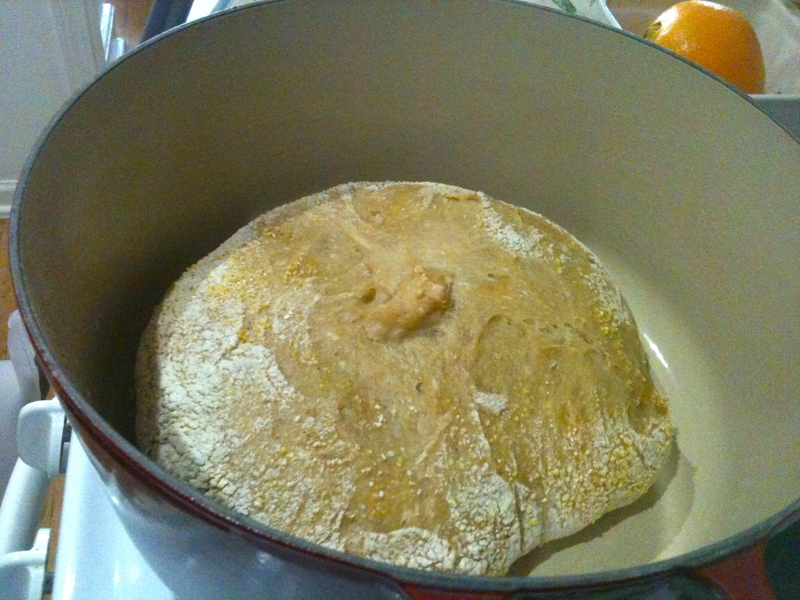 After 30 minutes have passed, remove lid and let bread finish baking uncovered, about 20 minutes, until nicely browned. 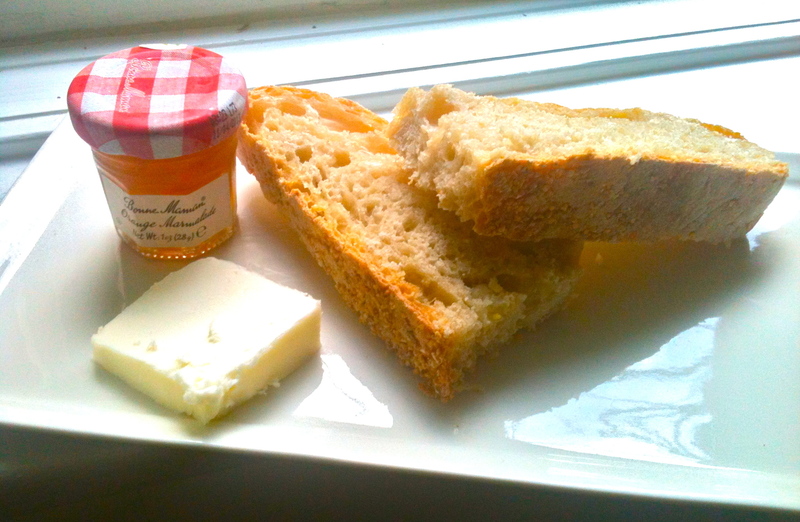 I love this bread with cold butter and orange marmalade, and it makes great garlic bread too. 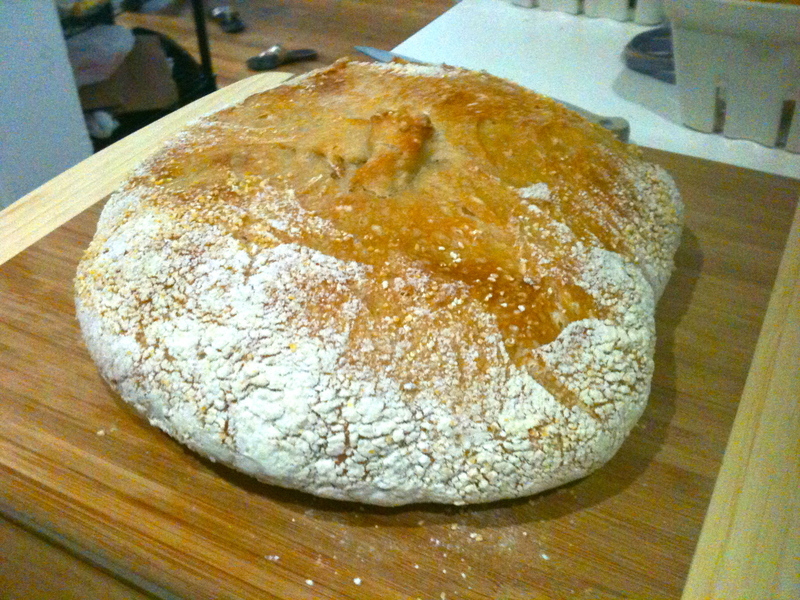 Enjoy it, and be proud of how gorgeous this easy bread turns out! Previous Sausage and Onion Tart. Next Cayenne Pepper and Orange Brownies.